Tibetan Pale Bellflower is a beautiful wildflower, closely related to Pale Bellflower, differing in the sepal tube which is deeply cut into sepals with broad bases overlapping the other sepals at the bases. Petals are bluish-white or pale-blue. It is a much branched hairy-stemmed plant, about 15-60 cm tall, bearing lax clusters of small bluish-white or pale-blue flowers. Flowers are bell-shaped, hairy, 8-15 mm long, lobed to less than half their length. Sepals are lance-shaped to triangular, 4-6 mm long, hairy. The sepals spread outwards. Leaves are stalkless, lanceshaped to oval, softly hairy, up to about 2.5 cm long. 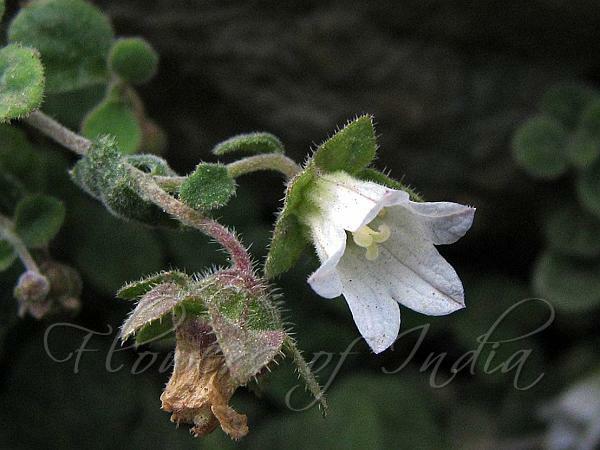 Tibetan Pale Bellflower is found in the northern parts of the Himalayas, in Pakistan, Ladakh and Tibet. at altitudes of up to 4500 m. Flowering: July-September.